Product code: ES7148 Categories: Art Deco, Art Deco Rings & Art Deco Engagement Rings. 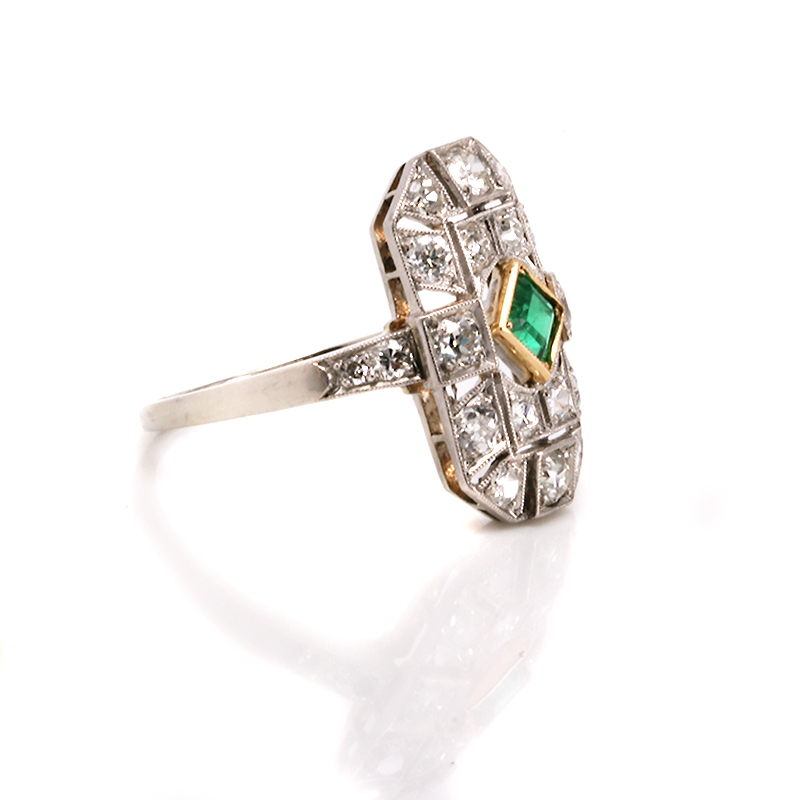 There is no doubt that rings from the Art Deco era of the 1920’s to the 1940’s are spectacular, and here is a stunning 1920’s Art Deco emerald and diamond ring that takes your breath away. Beautifully hand made in 18ct gold and platinum, the design alone is just incredible with the intricate detail and thought that went into making this ring all those years ago. Set with sixteen diamonds on the top, there are an additional two more diamonds set onto each side and these diamonds total 1.18 carats and sparkle magnificently. The way each diamond has been set in its own individual setting with the millgrain finish which can be seen as the elegant crimping around each setting adds to the character of this ring and then there is that incredibly vibrant emerald in the centre. The colour and transparency of this Colombian emerald is just superb and suits the quality of this ring so well and measuring 0.30 carats, it draws your eye to it and compliments the ring so well. This top section of the ring measures 19.6mm by 11.8mm this is Art Deco jewellery at its finest and this ring will certainly make a statement every time that it is worn.